If there’s a man who knows what it means to face tough times with Fitzroy and have his back against the wall, it’s Fitzroy legend Robert Walls. He also knows all about success. 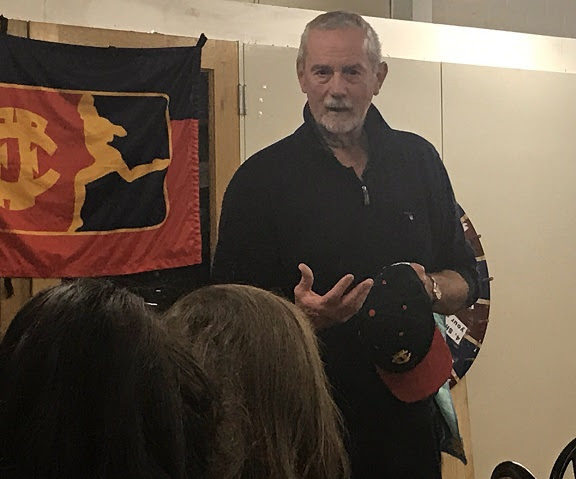 The former Roys’ and Carlton player and coach and now commentator and writer, Walls spoke to the playing group after training at BSO on Thursday night and had some clear and practical messages. As a premiership player and coach with Carlton, who learnt his craft from the man he describes as the most famous person in footy, Ron Barassi, Walls has plenty of experience, successes and failures to call on when he speaks. And the players listened. There were plenty of insights into the big names and some behind the scenes stories – covering everything from his early days as a 16 year old first gamer under Barassi, to grand finals in front of a crowd of 121,000, the contrast of cashed-up Carlton and under-resourced Fitzroy, the choice to play David Rhys Jones on Dermott Brereton in the 1987 grand final, observations of the differences between Michael Voss and Nathan Buckley as players, leaders and men, and the early days as coach of the Brisbane Bears playing in front of 5000 people at Carrara. Despite all the big names and fascinating reminiscences, it was the teacher and coach who shone through in the second part of the session, when Walls addressed the players about their approaches to team, training and the game. According to Walls, whether coaching successful or battling sides, the team will sink or swim based on the actions of the senior 5 or 6 players. “I know you are a young group here. The senior players need to show them the way. Set the standard. “To get the best out of young people you’ve gotta be honest and sometimes that hurts but you’ve also got to be encouraging. Focus on the things they've done well even in the losses. And the message for all players: you are your own best coach! “Have a plan when you come to training. Be clear and specific about what you need to get better and do plenty of work on your own weaknesses. Break it down. Walls gave his own examples. As a tall forward he needed to work on his play below his knees and he did a variety of things to improve. He told the players to be smart about how they prepare themselves and visualise how they see themselves playing. Walls said he would spend 40 minutes the night before a game visualising every element from arriving at the ground, to running out and how he would play against his opponent. For the long-time Fitzroy fans it will come as no surprise that Walls, who grew up in Brunswick, felt Fitzroy just had to work harder than everyone else at the time he was coach in the early 80s because they had less to work with. As just one insight into the haves and have nots, he spoke of the pre-season training at Fitzroy down at Warrnambool and then crossing to Carlton as coach, where they informed him pre-season would be a 10-day training camp at the University of Hawaii. It was a great night with a packed room of players and It doesn’t hurt to have your own ABC reporter leading the discussion! Thanks Richard Willingham. 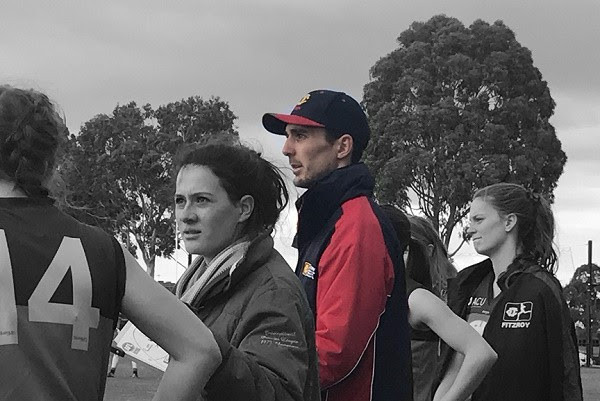 Using their pace and running to support each other are the keys for Fitzroy-ACU Women 1 in the finals, according to stand-in coach Lauchlan Dalgleish who has just wrapped up a five week stint with the Roy Girls. The former Bomber and current VFL-listed Footscray player has proven himself a more than handy replacement for coach Mick Symons, who has been travelling overseas. At the same time, Lauchlan credits the Roy Girls with reigniting his enthusiasm for the game. “They are just so enthusiastic. They can’t wait to get into training and games and they’re always keen to get better,” Lauchlan says of the Roy Girls. If you can have any such thing as a well-timed injury, Lauchlan just has, with torn ligaments in his ankle affording him the time on the sidelines for his first coaching gig. Partner of Fitzroy-ACU’s Annabel Watson, Lauchlan had been helping Mick out on game day since earlier in the season. He was back in the red, white and blue last weekend and hopes to help Footscray go deep into the finals. He also wants to help Fitzroy-ACU do the same. “I’d love to keep helping out. You can see the other teams improving all the time. Xavs (last weekend’s opponent, which Fitzroy held off in a very tight finish) were a better side than when we played them a few weeks back so we need to keep getting better too. The Roy Girls will have another very tough contest this weekend in the final home and away game, as opponents Caulfield Grammarians fight it out to finish in the top four. Caulfield proved extremely hard to throw off last time the teams met and they have everything to play for. It should be another good preparation for finals. Fitzroy-ACU will start its finals campaign next weekend, against top side SKOB Saints at 2pm on Saturday 5 August at Basil Reserve in East Malvern. Get it in the diary. All those details will be confirmed next week. Not that we are getting ahead of ourselves, but the VAFA has released the women’s grand final dates and venues today, with the Wilson’s Women’s Premier Grand Final to be played on Sunday 20 August at Sportscover Arena. Life member and former Fitzroy full-back Laurie Serafini will be the guest speaker at our pre-game lunch on Saturday 12 August at Brunswick Street Oval. 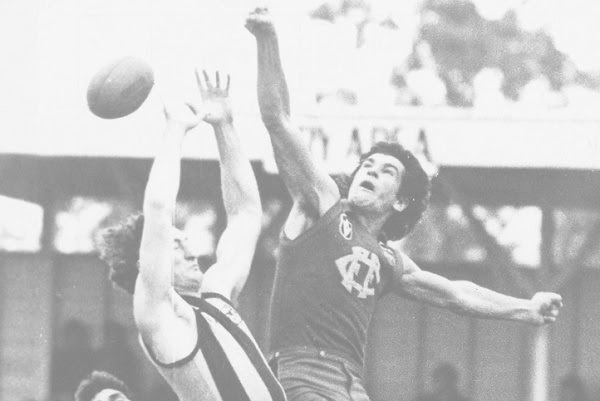 Laurie, who played 146 games for Fitzroy FC, was club vice-captain from 1981-1983, represented the Big V on three occasions, and served on the Brisbane Lions’ board for 14 years, is a regular visitor for BSO and loves to tell a story or two about his time in footy and beyond. Now a senior consultant for recruitment firm the Slade Group, Laurie has an extensive business background, having spent over 25 years in sales and marketing. He specialises in recruiting in the consumer, retail and sport sectors. For the last 15 years, Laurie has also had his own consultancy, working with senior executives and teams around high level pitching and presenting. His clients include the AFL, Bupa, Hyundai, Village and ANZ Bank. Along with his wife, Laurie is also developing townhouses at Balmoral Quay development in Geelong. Laurie is also an Ambassador for the EJ Whitten Foundation, raising awareness of men’s health issues. Part of the funds raised at the lunch will be donated to the Foundation. There will be plenty to talk about! Book now for lunch on the 12th August. It was a long time between drinks, but persistence paid off last Saturday when the 19(1) team tasted success against Uni Blacks, winning 13.8.86 to 3.13.31 at Ramsden Street Oval. Despite kicking only two goals in the first quarter with the aid of a huge wind, Fitzroy made up for it in the second quarter, keeping Blacks to the same total and kicking two goals against the breeze. This was thanks to great team play to keep hold of the ball and wind the clock down effectively. The third quarter was when the game was won, as the 19s kicked nine goals when they once again had the wind. They then held Blacks to just the one goal in the last quarter to run out 55-point winners. Better players included Noah Wright, Jimmy Miller, Captain James Butler, Aaron Tatchell, Lucien John and Oliver Read. Coach Tim Bell was thrilled with the team’s second win of the season and said with a winnable game this week against Uni Blues, the 19(1) team is looking to do something they haven’t been able to achieve all year and win back to back games. Whilst again more competitive, Fitzroy’s Under 19 (2) team went down to Aquinas AC, 9.3.57 to 12.14.86. Given injuries and absences the team has forfeited this weekend’s game. The Fitzroy men travel out to Monash University tomorrow for a triple header against the Monash Blues and each game becomes crucial after last week’s narrow loss to Mazenod. For the second time this year, the Nodders have had the wood over Fitzroy, this time finishing the stronger to take the points 9.8.62 to 11.9.75. Fitzroy led at half time but were outscored three goals to six in the second half. Nino Lazarro was welcomed back into the senior side and kicked three goals despite being double teamed for much of the day. Cailean Moore (35) was best for Fitzroy, with Nick Harrison (63) also rewarded for a strong game and Jack Dalton (26) was given the one percenter award. After the game, Senior Coach Nick Mitchell, asked the players and fans to have faith and said the team was working hard to turn things around. Fitzroy now sits in a precarious position just one game out of the relegation zone and will need to win some of their remaining games to stay in Premier B. You will have no doubt seen references to the streaker at Brunswick Street Oval on Saturday, even if you weren’t there to witness it. A young man ran the full length of BSO half way through the second quarter of the game. At that point Fitzroy seemed on top in the game and the momentum swung immediately after the disruption. It was certainly a talking point. After leading a closer game all day at Brunswick Street Oval, the Ressies suffered a heartbreaking 1 points loss which has probably put paid to finals action. Fitzroy led Mazenod for much of the game, but the visitors finished strongly outscoring the home side three goals to two, to take the points; 9.8.62 to 9.7.61. It was not the result the team wanted for captain Jack Atkinson playing his 150th. Sitting in 7th spot and three wins out of the four, the Reserves have a lot to do with five rounds to play. The Thirds also went down and have made things a little more challenging for themselves. De La Salle scored a convincing home win, 12.15.87 to 3.6.24. The Thirds will aim to get this Saturday’s triple header against Monash Blues at Frearson Oval off on the right note, with a win on Saturday. If they can, they will take a bit step towards a finals berth. 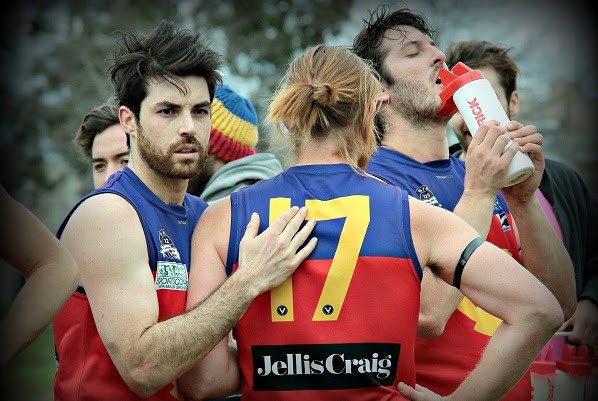 The Fitzroy players wore black arm bands in all games last Saturday in honour of the father of Thirds Captain, Jared Shaw, who passed away last week. The club’s love and condolences go to Jared and his family at this difficult time. The team from Fitzroy IT has taken the Fitzroy Football Club website to the next level, with a sharp makeover. The site went live this week with a clean and modern look, delivering easier access to news and social media coverage from the home page, and making maximum use of Phyllis’s beautiful photos. It also gives greater prominence to our sponsors. Fitzroy’s major sponsor, Fitzroy IT, is behind the new look. 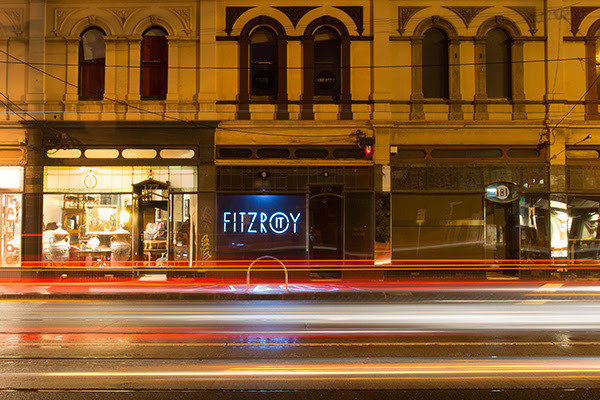 “We’re pretty passionate about the footy club and about our work so we wanted to make sure the site presents Fitzroy in the right way – up to date, connected with the community but not forgetting the history and heritage,” said Tim Jenkinson, Director. Business Development and Strategy Lead, Justin Kelly, who manages the relationship with the footy club, said “You’ll see a number of new features including the new social media feed, a restructured navigation, cleaner banner and refreshed homepage look and feel. “We first launched the site in 2015 and while it was great at that time, the digital landscape is changing rapidly, so we felt it needed to be freshened up to greater reflect the club and its supporters. 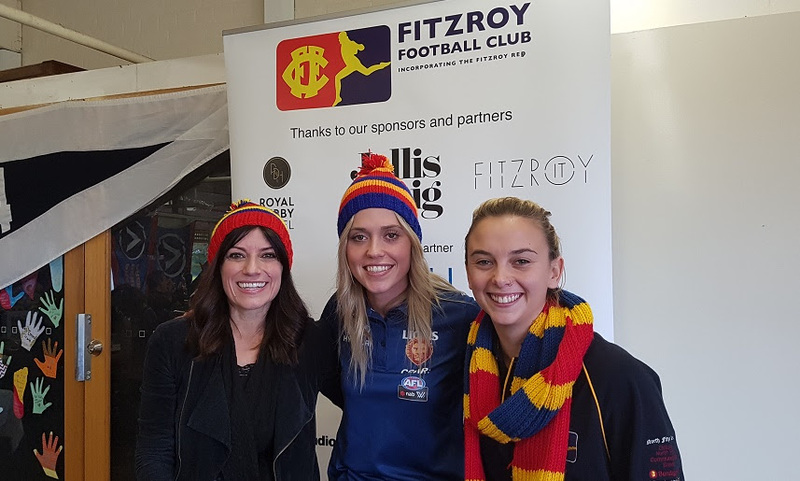 Director Communications and Media, Kate Nolan, said the club was rapt with the outcome and the support Fitzroy IT provides on an ongoing basis. “The Fitzroy IT team is always working closely with us to ensure we present a professional image online. “But there is still more work the club is planning, including getting some of our history content written and published, ensuring the Fitzroy-ACU women’s teams are well represented and generating some video content. The final home game lunch of the year on 26 August will be the Fitzroy IT sponsored game. The line-up for the day will include an interview with Pam Pederson, Sir Doug Nicholls’ daughter, and the presentation of our VAFA 125 club medallions. Details will be released soon on the website. Fitzroy IT has just expanded its office which is just a stone’s throw from Brunswick Street Oval at 179 St George’s Road. The team can be contacted for any of your digital, creative or IT needs on 1300 FITZ IT (348 948). It’s been a fantastic year for women in sport, but the message from our Women in Footy panel on Saturday was clear - there is a long way to go to before we achieve equality. Sports broadcaster and author, Angela Pippos, gave generously of her time and views on Saturday when she fronted our pre-game lunch and talked about what she’d learnt in writing her most recent book, Breaking the Mould – taking a hammer to sexism in sport. The good news is the conversation is changing and we’re making progress, thanks to teams like the Matildas and the community’s overwhelming response to the first season of AFLW. Ange was joined on a panel by Brisbane Lions star, Kaityln Ashmore, who had nothing but praise for her northern club and the access and support the women’s football team had been granted at the Lions. Fitzroy-ACU captain, Gemma Minuz, spoke about what it means to be a Roy Girl and do things in their own way, whilst embracing the culture and background of the club. It was top marks for both clubs in terms of how welcoming and inclusive they have been of the women’s teams.
. Surely it’s not too much to ask. Thanks to all three for such a great discussion, which threatened to run through til half time! Ange and Kaitlyn were presented with Fitzroy beanies as honorary Roy Girls and neither seemed in a rush to take them off. Watch out for Angela’s upcoming documentary on the first season of AFLW, which features Kaitlyn Ashmore and others and will be screening soon on ABC-TV. In the meantime, don’t miss out on reading Breaking the Mould – you’re bound to learn something new about women in sport and the fight for an equal playing field. Congratulations to Mel and Nick Mitchell who are expecting a baby later this year. 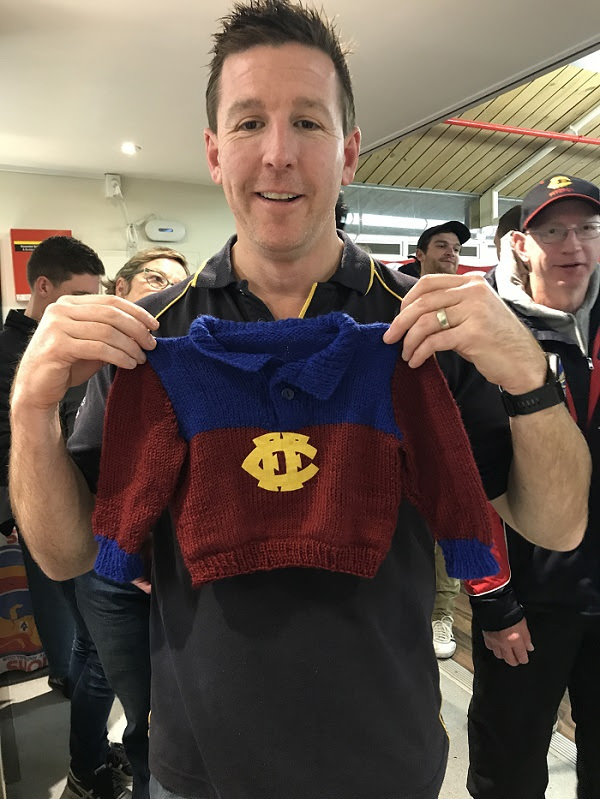 Well ahead of the birth, Fitzroy volunteer and knitter extraordinaire Louise Maniatakis has ensured the littlest Mitchell will be decked out in Fitzroy colours from Day 1. Louise presented the beautiful little jumper to a chuffed senior coach on Saturday night. She also ensured fellow volunteer, goal umpire and champion BBQ cook, David Barnes’ first grandchild also has a baby Roy jumper and booties. You are amazing Louise. Someone will turn $10 into $3000 on 12 August at Brunswick Street Oval. Will it be you? A $3000 travel voucher to the destination of your choice is the first prize in Fitzroy’s major raffle for 2017. You have until 5 August to purchase your tickets from any Fitzroy player, at the souvenir stall at home games at Brunswick Street Oval, and via the Fitzroy website. Third prize: a StarCash card to the value of $500, donated by Caltex Australia. If you are a player or supporter selling raffle tickets, please ensure you return all ticket books to the club by August 5. Thank you very much to the sponsors of this raffle, the Brisbane Lions Football Club and Caltex Australia. The Fitzroy Under 19 (2) team has forfeited to Melbourne High School Old this week.